Cyclone Giri made landfall in Rakhine State, Myanmar on 22 October 2010 reaching a category four status on the Saffir-Simpson scale. Myebon, Pauktaw, Kyaukpyu and Minbya were four of the most-severely affected townships following the impact of the Cyclone. Food, water and shelter sectors were severely affected with consequences felt by 260,000 people. Approximately 104,000 people were made homeless with 20,380 homes completely destroyed and there was no flash appeal called for this emergency. Support is required for those household that will not be able to rebuild and will be forced to spend the coming raining season in dwellings for below minimum and basic humanitarian and SPHERE standards in the absence of an immediate, urgent and lifesaving shelter intervention. UN-Habitat’s shelter recovery programme in post-Giri affected areas of Myanmar, through its three shelter programmes: “Rebuilding Homes-Rebuilding Lives” Rakhine Settlements Support Programme (RSSP) support by the Ministry of Foreign Affairs of Norway, Emergency Shelter Support for Homeless and Vulnerable Populations in Giri Affected Areas supported by CERF and Post-Cyclone Giri Community-Based Emergency and Early Recovery Initiative supported by ECHO, is designed to facilitate the retrofitting and rebuilding of basic shelter and essential household facilities and facilitate community action planning so that people can proactively participate in recovery while re-establishing community-based social protection measures and enhance community capacity to plan and manage the recovery process and sustained long-term development. UN-Habitat as a Shelter Working Group lead agency has been providing technical assistance to all local and international NGOs working in the shelter sector in Giri affected townships including technical designs, training to local NGOs, providing of manuals and carpenters training. The programme’s goal is to improve the shelter conditions of most vulnerable households through provision of shelter materials, rapid skills upgrading for safer building techniques, promotion of livelihoods with local construction and mobilization of building materials; injection of cash into local economy through housing programmes that provide livelihood opportunities for unskilled workers, artisans, carpenters, masons, and ensure sustainability of resettlement sites with integrated approach. The programme provides communities with grants and the organizational and technical guidance necessary to rehabilitate and rebuild their shelter. Providing technical assistance to all local and international NGOs working the shelter sector in Giri affected townships including technical designs, training to local NGOs, provision of manuals and carpenters training. 5,424 household were provided with community access to water and sanitation facilities. 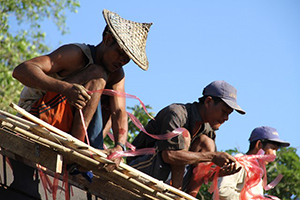 739 community carpenters and other artisans were trained in disaster resilient construction techniques and provided with toolkits. 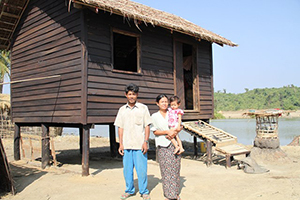 20 most vulnerable households were provided with a model house constructed during the on the job carpentry training.